Perhaps the only guarantee in the world of sports is there are no guarantees. Players get injured, coaches get fired, and general managers trade away the past in order to make the future better. In the American Hockey League, the stability of it all is often so precarious that many teams are unable to get out from under it. 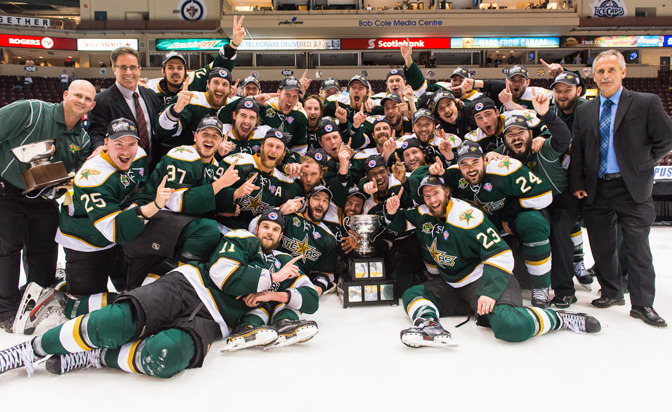 For the Texas Stars, a season removed from winning the franchise's first Calder Cup, stability is something they have in spades. Of the 28 names recently engraved on the Cup, 18 are returning to Cedar Park for the start of the 2014-15 season, which begins Friday. This core knows not only how to win, but how to win together, a luxury not many other teams can tap into. "It was a great experience for everyone last year, and it gives everyone that much more confidence and that much more experience getting to go on a big run like that," said second-year pro Curtis McKenzie. "Now everyone knows we can be champions." McKenzie was Dallas' sixth-round pick (No. 159) in the 2009 NHL Draft. He became a key piece of the Stars offense in 2013-14 primarily skating on the left wing with Travis Morin and Colton Sceviour, scoring 27 goals and 65 points in 75 games. "Last year was great because I was kind of playing catch-up with Morin and Sceviour, and trying to keep up with them," he said. "That was a huge stride to my development, playing with those two. Now this year I just have to find ways where I can keep improving so I can get to the next level." His development paid off, earning him the AHL's Dudley (Red) Garrett Memorial Award as the league's top rookie as well as a spot on the All-Rookie Team. Though Sceviour is now in Dallas, the new crop of players coming in will be able to step up in his absence. "We still have high expectations with all the guys we have coming back, and we've got some young guys coming up that can help out too," Morin said. "Once you get to the top, you always want to be back because it's such a great feeling." One of the original Texas Stars from their inaugural 2009-10 season, Morin is a core part of their leadership group. Morin led the AHL in scoring and was named most valuable player during the regular season, feats he then duplicated in the Calder Cup Playoffs. Under former coach Willie Desjardins, Texas stormed through the league with its unstoppable power play, a dominant goaltending tandem in Cristopher Nilstorp and Jack Campbell, and a puck possession game that often made it all look too easy. When Desjardins took the Vancouver Canucks coaching position in June, it gave way to a new voice in the locker room. "We've had a few meetings, and in running the practices, they get a feel for who I am as a head coach," said Derek Laxdal, who was given the reins on July 3. "And vice versa, we need to get to know who these players are. It's going to be nice to get some games under our belt here so we get a chance to set the tone. Instead of being the hunters, you've become the hunted." Laxdal, like his new players and his predecessor, knows how to win. His style is similar to that of Desjardins, an up-tempo game that won him two Western Hockey League titles and a Memorial Cup with Edmonton. That similarity is another constant Texas is grateful for; without having to learn a completely new system on the fly, the season can begin with far less bumps in the road. "He understands that a lot of the guys are coming back and we've got a good thing going here. He's not going to try and redo everything we do," Morin said. "He's just going to put his touches on our game plan and our philosophy. He's a proven winner, so I think he'll be a success down here." Wing Scott Glennie, a first-round pick (No. 8) by Dallas in 2009, agrees with Morin. "I think Derek hasn't really come in here and changed much," Glennie said. "I know he's got a couple of things that are a little different, but for the most part, things haven't really changed that much at all, so that's been nice." In fact, at first glance, the only thing that looks uncertain for Texas is the goaltending situation. With the departure of Nilstorp to the Swedish Hockey League over the summer, the other half of last season's tandem was left open. But even this problem is one Laxdal easily sees solved. "We've got a great 1A-1B punch here with Jack Campbell and Jussi Rynnas," he said. "We've got two capable goaltenders that can help us win games, and if there's a call-up situation, one goaltender can go up and the other can hold the fort in Texas." The Stars have the exact same toolkit from last season: High-powered offense, a strong defense and two goalies with unending upside. With three veterans wearing the letters, a return of the majority of last season's core and a new wave of promising Dallas prospects like Radek Faksa, Julius Honka and John Klingberg, there will be no Calder Cup hangover for this team. "We're not going to change or reinvent the wheel at all," captain Maxime Fortunus said. "We're going to do our thing and if we do it hard and the way we're supposed to, other teams are going to have to adjust to us."